(15 mins) In this episode, Harold Reitman, M.D. 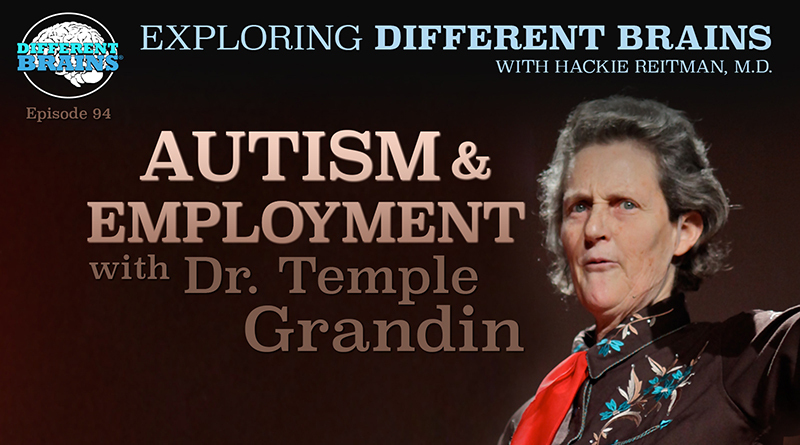 speaks with celebrated autism advocate and author Dr. Temple Grandin. The two, who have previously met and presented along side each other at conferences, had a chance encounter in an airport that they decided to turn into an episode of Exploring Different Brains. Because of this the audio of this episode is not up to our normal standards, but we hope you will still enjoy it and benefit from Dr. Grandin’s wise words. She discusses the importance of people on the spectrum learning how to have a job, the need for job and social skills to be taught to children, and the need for people on the spectrum to move outside their comfort zones. HACKIE REITMAN, M.D. 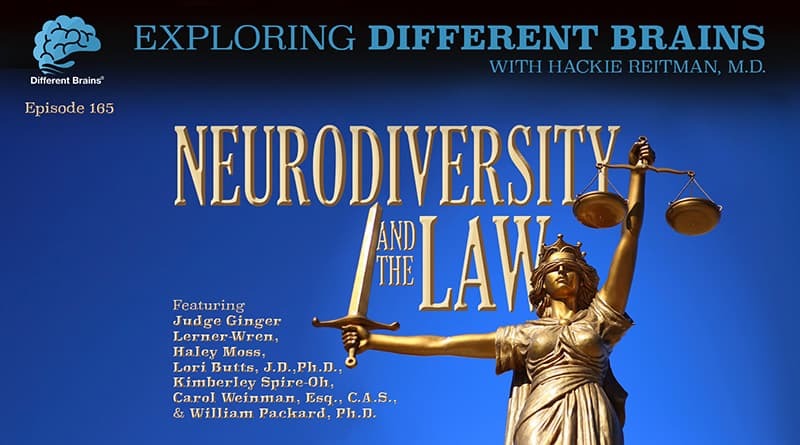 (HR): Hello there, I’m Dr. Hackie Reitman of DifferentBrains.org. Welcome to another episode of Exploring Different Brains. Boy, are we lucky today? We have for our interview, none other than the rock star of all of autism, our friend Temple Grandin. Temple Grandin, who I’ve been fortunate enough to share the stage with speaking the USAAA, and at the AADMD. She has done so much for all of us whose brains might be different. She’s an extraordinary woman who happens to have autism, whose life story, books, and advocacy, have done so much for mainstreaming the acceptance of people on the spectrum. Recently, I was at an airport here in South Florida, and so was Temple Grandin. We were both on a flight going out to Colorado, and as luck would have it, the flight was delayed. Temple was so nice, and so cooperative because we turned this into an interview for Exploring Different Brains. Temple Grandin is very focused on the importance of employment, getting a job, responsibility. The first question I asked her was how do we advance the job skills of those with autism? TEMPLE GRANDIN, PH.D. (TG): Yeah well I’m seeing in just the last few years, probably 3 or 4 years, there is more problems with a lack of learning job skills. And when mothers come up and talk to me at conferences and their child is fully verbal maybe 18, 21, 22 years old I’m kind of seeing two paths. A good path where they’ve learned work skills and they’ve had jobs before they’ve graduated from high school, going out there and doing quite well on getting a career. And the other path I’ve seen is the kid becoming a recluse in his room playing video games 8 hours a day and that’s not a good path to go down and it’s really difficult to wean them off the video games, has to be done really slowly and replaced with something else. And one of the things I’m going to suggest is auto-mechanics and diesel-mechanics because there’s a huge shortage right now of a mechanical skill trades people. The other thing in careers is developing the kind of skills that work for that particular kid. I was an extreme visual thinker. So, my work with cattle is the field of industrial design, so that’s the art side of engineering. Then you have another kind of autistic brain that is the pattern thinker, the mathematical thinker–computer programmers, engineers. And the third type is the person that is the word thinker. They’re going to be good at a job that requires language. And there’s evidence based for this and I cover it in my book on the autistic brain which you can pick up online. You know I do talks and a lot of things in the autism world but for years I’ve worked in construction and the cattle world. I’ve been out to Silicon Valley, to tech companies and I see programmers out there that I know are on the spectrum. I see engineering majors that are just enrolling into the university that I know are on the spectrum and they are undiagnosed. So as I go back and forth between the different worlds, I’m seeing an old hippie guy who’s the head of maintenance for a large meat packing plant and they’re not able to replace him. And what really bothers me is to see smart kids end up playing video games in the basement when they ought to be fixing Tyson plants. Tyson’s hiring right now and United Airlines is also hiring mechanics right now; there’s a shortage. HR: What is your perception of the overall spectrum of all neurodiversity. TG: Well one of the problems with autism diagnosis, especially since they’ve changed the guidelines in 2013 is that you now have a huge spectrum that goes from Einstein and someone who should be working in Silicon Valley to somebody who can’t dress themselves and I’m seeing more problems when I talk to moms of getting kind of a handicap mentality, even when you have a child that’s absolutely fully verbal when he’s a teenager. Those use to be called Asperger’s before and I’m seeing a lot of problems with being overprotected, they’re not learning basic skills like shaking hands and shopping. Five years ago I would’ve never have dreamed that I would’ve had to talk about learning shopping. That is something I learned when I was seven years old. I got 50 cents a week for allowance and knew I could buy five comics with that or ten candy bars with it, and if I wanted that 69 cent airplane I had to save for two weeks. That taught some basic money skills. HR: Where do you think autism ranks, so to speak, with other neurodiversities such as dyslexia, ADHD, and then mental health issues. Are there a lot of comorbitities? TG: Well there’s a lot of crossover genetically. I’ve actually looked at some genetic research, ADHD and fully verbal autism, there is crossover with some OCD, dyslexia. They’re not the same things but there’s crossover. I took this logic class when you have the vin diagrams where they over-lap like the olympic rings, its kind of like vin diagrams. There is an intersection where something like OCD or ADHD over-laps with autism. HR: Now the first chapter in the Aspertools book I made anxiety because I think that rules us all. Where does anxiety play a role here? TG: I had horrible problems with panic attacks to anxiety and they started at puberty and I’ve been on anti-depressant medication for the last 35 years. It saved me and it’s very important to use low doses. In my book “Thinking in Pictures”–which you can easily pick up online–I describe my personal experiences with a low dose of anti-depressants. The mistake that doctors make, prozac or zoloft and other anti-depressants, is too high a dose. Those label doses are for depression. You give too high a dose, you’re going to get agitation and insomnia. They are raising doses when they should be lowering, but low dose of anti-depressant medication absolutely saved me. HR: What do you think of the recent studies showing the re-wiring of the brain with neuroplasticity with simple things like diet and exercise. TG: Well there’s a lot of research that shows that exercise is good for the brain. You want evidence based, you can get evidence based on that and I do a hundred sit-ups everyday on the bed and it has really helped me with sleep. The one thing that I’ve observed since new guidelines came out in 2013 in the DSM is more problems with kids not learning shopping and basic skills and working skills. So prior to 2013, a child would be diagnosed with Aspergers if they were socially awkward with no speech delaying, and autism had to have speech delay and now its all just one big great spectrum. And I’m seeing worse problems getting the handicap mentality with things such as never learning shopping or not learning working skills because the individuals that learn to work before they graduate from high school, I think they are having a much better prognosis. And I’m referring to the fully verbal kids, that can have normal speech and can read and write at an adult level. HR: What’s the biggest single thing that parents can do differently, you would say? TG: My mother had a really good sense of just how much to stretch me slightly outside my comfort zone so I’d keep learning and doing new things. It was her idea to have me go out to my aunt’s ranch and after I’d done my aunt’s ranch for two summers she said, “well lets do something else and we’ll do the aunt’s ranch for half the summer and we’ll do an internship at a research lab for the other half of the summer.” Also, I was an aid for a child with autism, another half of the summer. Always stretching, she never threw me into the deep end of the pool, but always stretching and doing new things. I was hostess at her parties with I was 7, 8 years old. She got me a sewing job when I was 13 years old, and when I went away to my boarding school I ran the horse barn, cleaning stalls everyday, putting the horses in and out, feeding the horses. And now, when I look back on it, riding the horses was really fun, but actually the most important thing for my development was running the horse barn and learning how to work. HR: Tell us about how you learned how to drive. TG: Well that was out on my aunt’s ranch and we had to pick the mail up everyday and it was 3 miles up to the mailbox on a dirt road and 3 miles back. So I did 200 miles on dirt roads before I did any traffic. So what I recommend on driving is burn up a tank of gas, in a totally safe place, in back country roads, in big stadium parking lots, and even before driver’s ed. Because driver’s ed throws these kids into it way too quickly. They need to completely learn how to operate the car before they have to deal with traffic. HR: The interaction with other human beings can be a limiting factor. TG: Well when I was a young child, my mother made me be the hostess at her parties. Made me greet the guests. Kids in my generation were taught social skills in a much more systematic way. You were taught how to shake hands. I’m saying too many kids today at fully verbal, nobody’s instructed them just how far apart to stand, the exact way to shake hands. Now I just got back from Brazil and they do a lot of hugging and kissing, Well you’ve got to learn when exactly that is appropriate. You don’t do it the first time you meet the person. HR: What advice would you have for the adolescent who’s first getting into dating in his teens, or her teens? TG: Well I think that where they’re going to be the most successful is where there is a shared interest. I’ve talked to a lot of people who have been in successful marriages, it would be two computer people who met each other at a science fiction meeting. But the shared interests is a really good way to find people that you’re gonna have a relationship with. HR: What can DifferentBrains.org do to help you, not that you need any help, achieve your mission and your goals? TG: My big concerns I’ve got right now, is I’m seeing a lot of talented kids aren’t learning just normal skills, like shopping. You know, the kid that’s 13 years old or seventeen years old has never gone to the store and shopped. And when I go back and forth between tech industry and the cattle industry, and then I do an autism meeting, I see old people–welders– I’ve worked with working on equipment in these big beef plants, that I know are on the spectrum. Some of these people own metal fabrication companies. You go the computer companies, and I see people there that I know are on the spectrum. So what I’m saying is, one kind of socially awkward guy gets addicted to video games, becomes a recluse in the house, the other one that learns how to work before he graduates form high school and is doing real well. When I was fifteen, sixteen years old, I was cleaning horse stalls every day. And when I look back on that now, one of the things I learned is that I learned how to work cleaning those horse stalls. And just in the last five or six years, I’m finding that the learning how to work while you’re still in high school. really important. I had nine stalls to clean every single day. I put the horses in and out of the barn, and I fed them. HR: So the biggest single problem you feel now is the social awkwardness, and the not working, not holding a job, not learning the basic skills of life. TG: What I’m seeing is some moms having a lot of problems with letting go. When I talk to one mom about her thirteen year old maybe going shopping for the first time to buy some printer paper, she started breaking down and crying, saying she couldn’t let go, and all I suggested was buying something at the office supply store. I’m not suggesting anything dangerous. I’m just suggesting the most normal safe thing. TG: Basic shopping! I mean five years ago, I never dreamed I would have to talk about shopping. But now I’m finding fully verbal, smart kids, that look like a junior version of somebody that oughta’ be working for Microsoft or Google, and they haven’t gone shopping. And they also never had a job. They need to learn that discipline. They gotta’ be there every day and do the job. When I was fifteen, sixteen years old, I cleaned nine stalls every day. Horse stalls. HR: I just watched you as one of your admirers came up, and her daughter wanted to shake hands and was having difficulty. And you were mentoring her right there on the spot. TG: And then she went away for a little bit, and she came back and asked for a picture, and she spoke up louder, and she learned how to shake hands better. You’ve got to demonstrate to these children how to shake hands, and greet people, like teaching somebody in a foreign country. You see, in my generation in the 50s, social skills like shaking hands was done in a much more social structured way. And they used the method I call teachable moments. For example, if I stirred a drink with my finger, mother didn’t say no, she’d say use the spoon. She gave the instruction instead of saying no. HR: And you see, our hero at Different Brains, Temple Grandin, who is to neurodiversity as Elvis was to music is so inspiring. Here she is at the airport, taking time to interview with Different Brains here, mentoring people who are coming up to her, and she’s bigger than life. And we’ll be speaking together out in Portland at the USAAA. TG: That’s right. Yep, I’m really looking forward to coming to that. And I just wanna see these kids be everything that they can be. And I’m seeing more problems today, especially with fully verbal kids who are not learning basic skills. Shake hands with people, shopping. And their prognosis is gonna be a whole lot better if they have two real jobs, under their belt, before they graduate from high school. Another example was a girl who worked several summers at Dairy Queen, and then she learned about nursing. And she’s gotten married and has a successful nursing career. TG: Thank you so much! HR: Thank you for everything. HR: So that’s it for another episode of Exploring Different Brains. Thanks to Dr. Temple Grandin, for doing this great spur of the moment interview. For more on Dr. Grandin–in case you’ve been living under a rock because she’s so famous–but you can check out her website at templegrandin.com. Thank you! 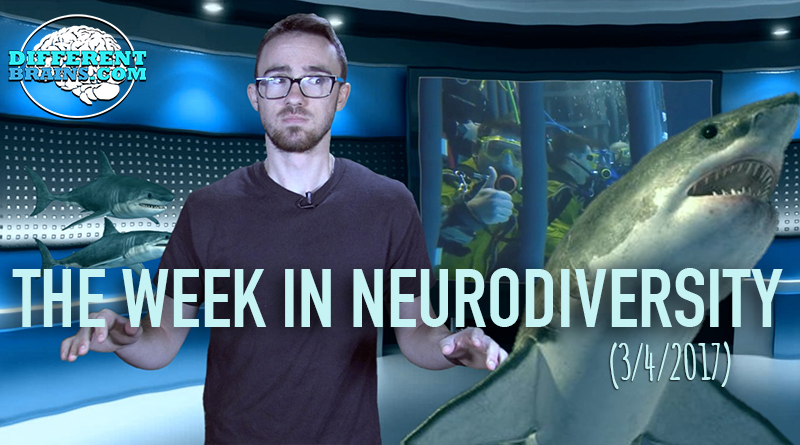 (4 mins 5 sec) In this episode: a former hockey player talks about living with OCD, a man bikes 4,000 miles for Parkinson’s research, and veterans with PTSD go diving with sharks! These stories and more in this week’s edition. 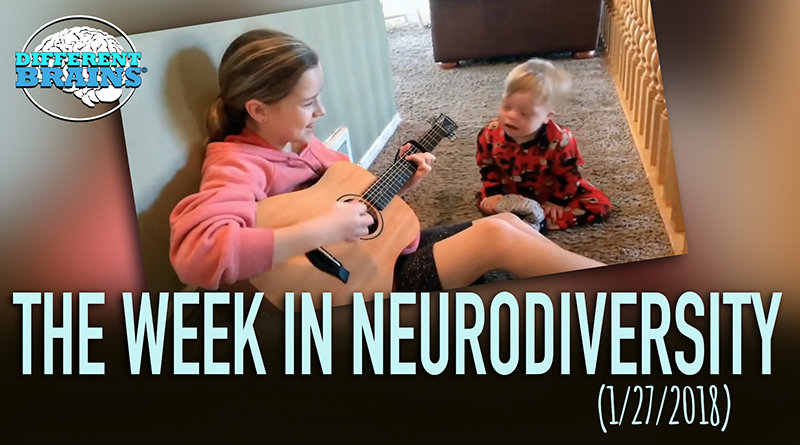 (3 min 34 sec) A college student with dyslexia learned 8 languages, a new online service is helping children on the autism spectrum, and have you seen this viral video of a girl singing with her younger brother with Down syndrome?